February 2019 - Be On The Road | Live your Travel Dream! We all go and see god in his home (temple), but have you heard of gods coming to your home to see you. Well, I am not joking! It does happen quite often in the villages of South India. It happens else where in India as well, but I have seen it happen more often in the South. Or may be because I have better access to it. Well, the Rath Yatra that happens at Puri Jagannath Temple is possibly the biggest example that I can think of. But, it is of massive proportions and it happens only once a year. But, in the South Indian temples it happens quite often. And that is what I wish to bring to your attention through this video story. Apart from the main sanctum sanctorum where the idol of the main god(s) exists, there is a panchaloha or brass version of the god(s) kept at a corner of the temple and this idol is called Utsava Murthy. These Utsava Murthy gods take to the streets in pomp and grandeur during important festivals and occasions. Decked in beautiful clothes and ornaments, the Utsava Murthy god is kept on top of a chariot that is pulled by the people of the village. Sometimes, only brahmins are allowed to pull the chariot. However, at many times, anybody can pull the chariot of the lord. This chariot then takes a circuitous route and makes its way through the different streets of the village and stops at each home. When the god arrives at their home, the people rush out of their home, offer coconuts, fruits, flowers and even clothes to the lord and seek his/her blessings. This rath yatra can take place only on one day or every day for a fixed number of days. It could happen during day or night. All the variables depend on the temple, the god, the festival and the dates. Utsava murthy of different temples take to the streets on different days of the year. For example, the Garuda god of the Vishnu temple in my village takes to the street on each Saturday of the Poratassi Tamil month and this video story that you see is the Thiruvadarai festival when Lord Shiva took to the streets. During this Thiruvadarai festival, Lord Shiva visited the people’s homes every evening for 6 days and then on the 7th day, which is also the day of Thiruvadarai in Margazhi Tamil month, he visits everyone’s home in the early hours of the morning. 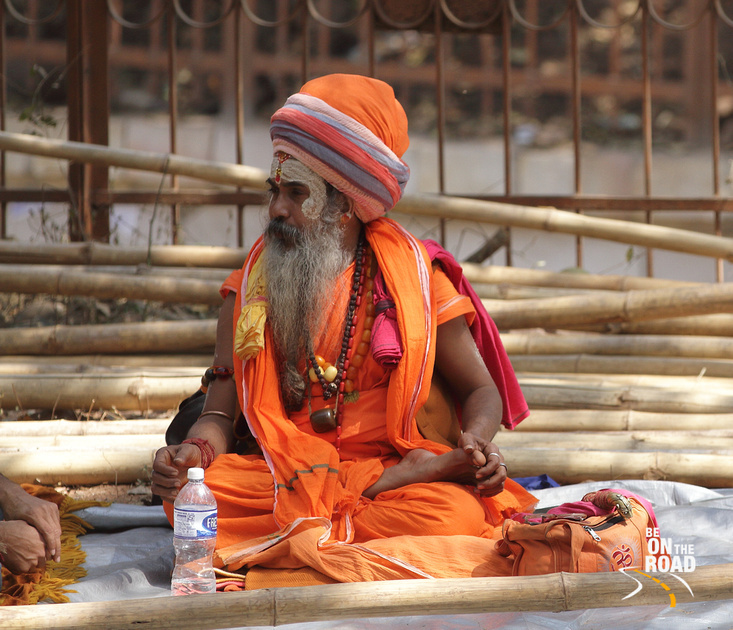 This is his last trip for this festival and then he returns to his temple and stays there till the next festival when he can take to the streets again. I got to experience this rich tradition at Kallidaikurichi, a beautiful village in India’s deep south and that is a perfect place to experience the beautiful traditions of Tamil Nadu and South India. Apart from such unique experiences, one can also experience the festival of Pongal in such traditional villages to get a true festival experience. This village also happens to be my ancestral home. So, if you are around for a rural holiday, do give me a shout out! King Ashoka or Ashoka the Great, was one of India’s greatest kings. The grandson of Chandragupta Maurya, the founder of the Maurya dynasty, King Ashoka ruled almost all of the Indian subcontinent from 268 to 232 BC. From Afghanistan in the west to Bangladesh in the East and from Kashmir in the north to Tamil Nadu, Karnataka and Kerala in the South, his empire’s reign was absolutely massive. The turning point in his life came right after he won the bloody Kalinga (the land we know as Odisha today) war. He was deeply affected by all the bloodshed and that is when he made the switch to Buddhism and became one of the strongest preachers and ambassadors of Buddhism in the world. It was because of him that Buddhism spread to Sri Lanka, Thailand, Myanmar, Tibet, China, Laos, Cambodia, Vietnam, Indonesia and other countries in the far east. As Indians, we have learned and read about him in our schools and books and see his influence on our Indian flag, our currencies and at many other locations across the country (I am referring to his emblem as seen on Sarnath’s Ashoka pillar). But, nothing comes close to the experience of transporting yourself 2,500 years to the time where lands were known as Kalinga, Magadh, Patliputra, etc. and re-living the life of one of the greatest kings the planet has ever known. 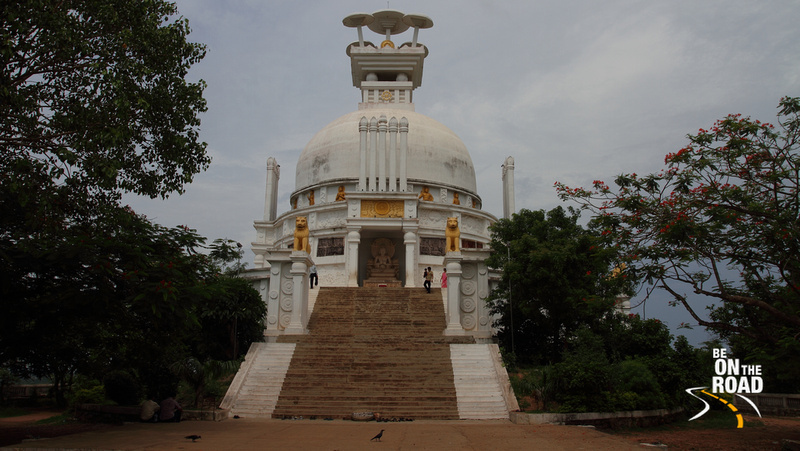 One of the best places to have this experience is Dhauli Stupa, the place from where you can see the Kalinga battlefield and the place where King Ashoka left his violence behind and embraced the guidance and teachings of Lord Buddha. This story is told every evening at Dhauli Stupa through a spectacular light and sound show. Created by renowned Russian artist Maria Rud and local sand artists, this visual and auditory treat carries the iconic voice of Om Puri (in Hindi), Kabir Bedi (in English) and Bijaya Mohanty (in Odia). 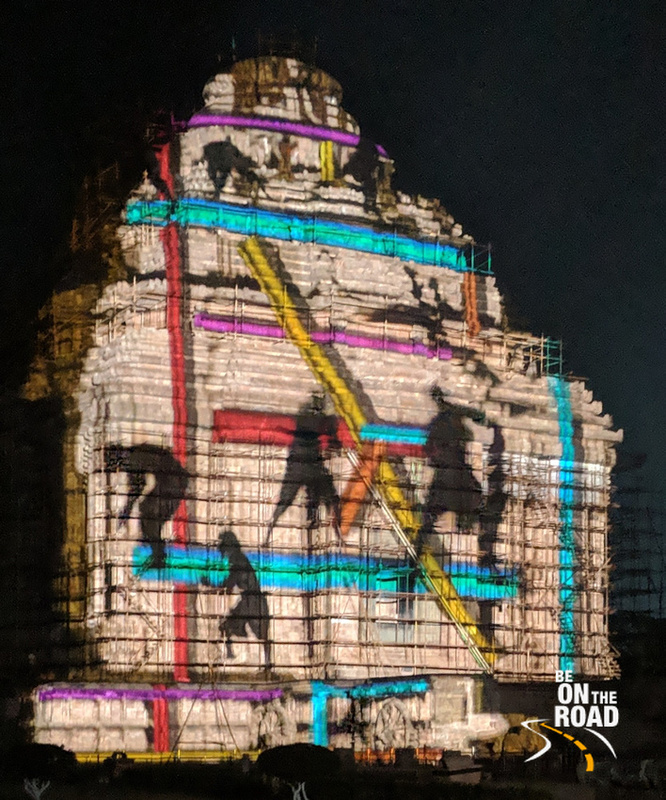 During this show, the white peace pagoda of Dhauli is morphed into a fast moving mural canvas with the latest 3D projection mapping technology and 5.1 surround sound. It is a must experience for all visitors on a holiday to Odisha! Below is the entire light and sound show in 3 video parts for all those who cannot travel to Dhauli and experience it in person. Do watch it on big screens with highest resolution and good quality sound system to appreciate it more. I took all three videos using my Google Pixel 2XL mobile phone. How to reach there: Bhubaneshwar is your nearest airport, railway station and bus hub. You can reach Dhauli by road in about 60 minutes from Bhubaneshwar. You could either hire an auto rickshaw or car for the commute. 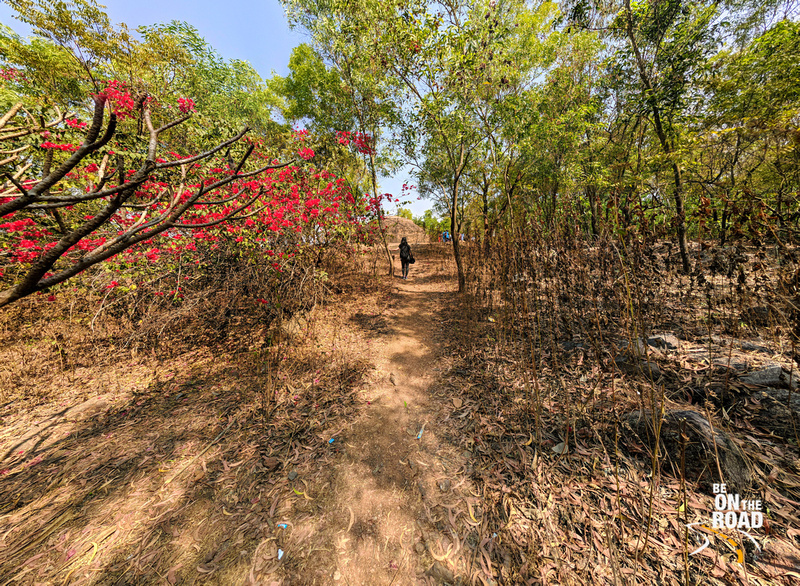 There are a few steps that one has to climb to reach Dhauli hill from the parking lot. Best Season: Winter would be the ideal season to see this show as temperatures would be very pleasant. In my over three decades of living and traveling in India, I have understood pretty clearly that one lifetime isn’t enough to experience our own magical backyard and diverse land that we proudly refer to as ‘Incredible India’. We are one of the oldest living civilizations in the world. Which means that there is so much heritage to discover in so many different corners of our country. And we might not even know about it even though we might be living next to it or we might have visited that place many a times. I went through a similar experience during my recent trip to Odisha, the land that is dubbed as ‘India’s best kept secret’. 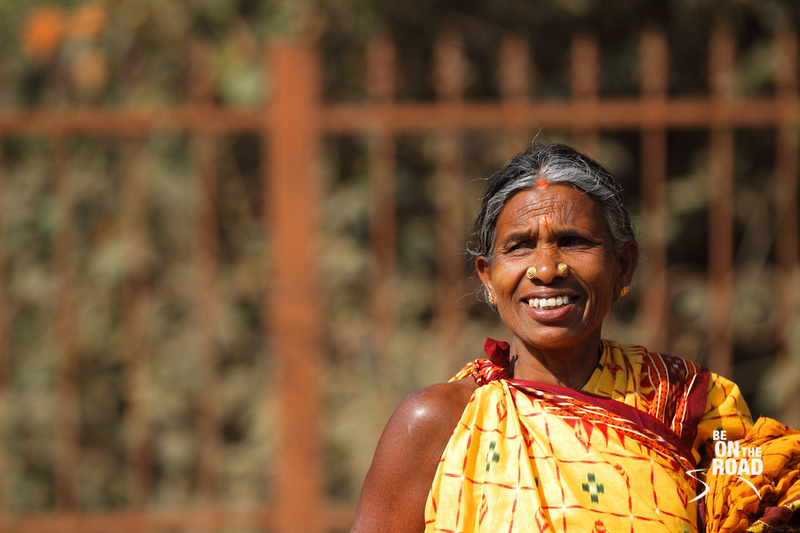 Now, I have visited Odisha quite a few times in the past, but on this trip, I saw her in entirely new light. 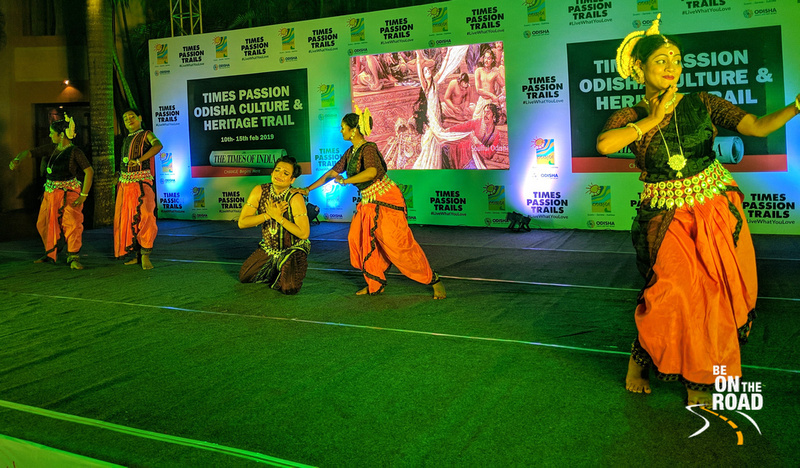 And I have to thank Times Passion Trails and Odisha Tourism for it as it was them who took me and 20 other people on a culture and heritage trail across Odisha. What I saw, experienced and learnt on this trip makes me ponder in amazement at the sheer riches of our country. And for that to happen on our trips, we need a good travel partner. A partner who can let us see us experience the real and hidden India that most of us are blatantly unaware of. Times Passion Trails, an initiative by the Times of India, is one such partner who allows you to experience the destination from a richer perspective. I am so happy that I went on this Odisha heritage trip with them. They are not your regular travel agent or tour operator, but they offer curated experiences that take the game to a whole new level. Below are some of the highlights of traveling with Times Passion Trails. The other key highlight of traveling with Times Passion Trails is the fact that each of their trips are curated by subject matter experts who they refer to as ‘Experience Architects’. They are not your tour guides, but specialists who have spent their entire life in that field. The experience architect on my trip was Dr Navina Jafa, a Fulbright scholar who has worked at the Smithsonian Museum in Washington DC, taught about Indian and South Asian cultures at various universities, a trained Indian classical dancer and someone who has been interpreting heritage for the last two decades. She not only gave us information about the destinations we visited, but made us aware of the entire cultural story, which included people, history, art, dance, food, languages, etc. and thus allowing us to think and appreciate the heritage locations from a whole different perspective. And in addition to this special Experience Architect, we also had access to a knowledgeable local guide. So, we not only got the intellectual download, but we got a good understanding of the local stories and the folklore too. I usually travel independently because tour groups aren’t usually flexible with their time and plans. But, it is here that Times Passion Trails surprised me yet again. On this trip, I noticed how effortlessly they accommodated the time, whims and fancies and requests of the different people on the group. Be it shopping, medical emergencies, special food needs or just some crazy request, they seamlessly tried to accommodate all of it. And due to that, they won a lot of brownie points in everybody’s book. ’Paisa Vasool’ is the usual motto when we Indians spend our money. Times Passion Trails fits that bill well. They offer stay in 4 star or equivalent hotel, they offer sumptuous food, they offer experience architects and guides, they offer air conditioned ground transportation and the best of breed experiences for a very affordable fee. My Odisha culture and heritage trail was priced at INR 35,000 for 5 night and 6 days and the Odisha wildlife and bird photography trail that starts today is priced at INR 40,000 for 6 night and 7 days. One of the key things that I treasure the most about my trip with Times Passion Trails and Odisha Tourism are the people with whom I explored the various art, culture and heritage trails of Odisha. They were a varied bunch ranging from ex army personnel, doctors, archaeology students, dancers, businessmen to individuals working in different rungs of the corporate world. 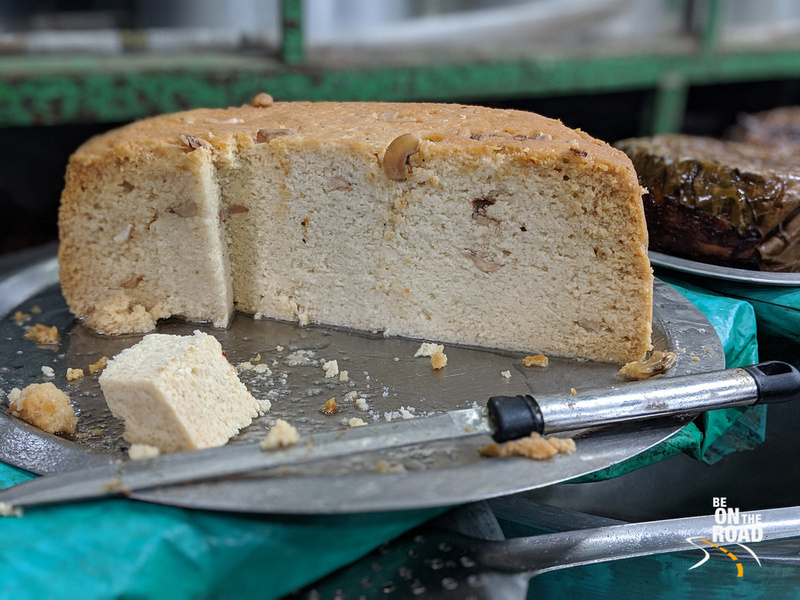 Even though all of us came to this trip from different parts of the country and with different backgrounds, we all seemed to relish the time we spent in Odisha and all of us took a huge liking to the hidden heritage trails of Odisha and the local desserts. And ended up creating a ton of memories in the interim. Things weren’t always rosy and good. There were some small issues with logistics a couple of times. To me, it was adventure. But, for some, it was tiring. So yes, there is scope for improvement and I am pretty sure that Times Passion Trails and Odisha Tourism will address it in their next trips. What I liked the most about Times Passion Trails and Odisha Tourism is their eagerness in asking for personal feedback. And no, it wasn’t cliché feedback forms, but in person feedback session at the end of the trip by the top management of both organizations. That according to me is pretty special. Their next trip is a wildlife and bird photograph trail through some of the popular and lesser known wildlife trails of Odisha. The trip starts on February 25th, but unfortunately, all the registrations for this trail have been closed. Give them a look when you find time and do keep track of their upcoming trails. You never know, they might have something that might pique your interest! Disclosure: I was invited on this trip by Times Passion Trails and Odisha Tourism, but all the thoughts mentioned in this article are purely based on my personal experience and have been written without any prejudice and with complete honesty and transparency. They genuinely echo my sentiments. 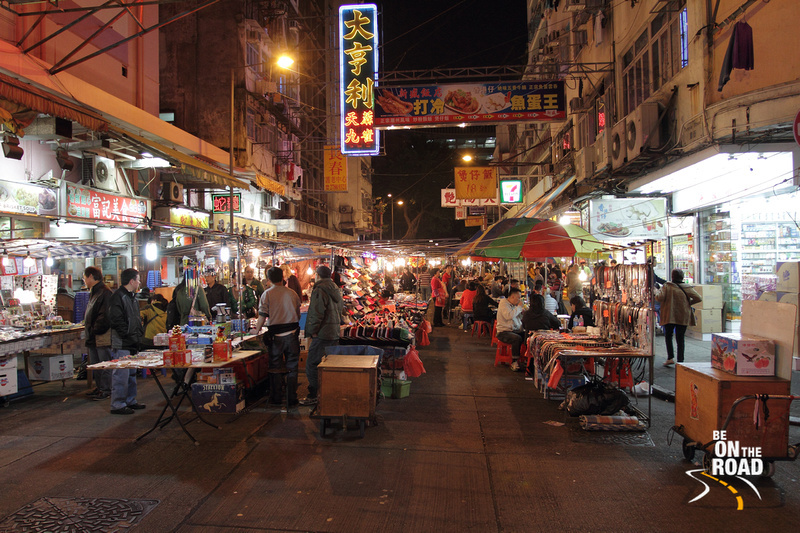 When it comes to street food, Hong Kong certainly rules the roost! After all, there are very state or areas that not only offer a vast range of gastronomical delights right on the streets and can fill you up with just a few bucks. 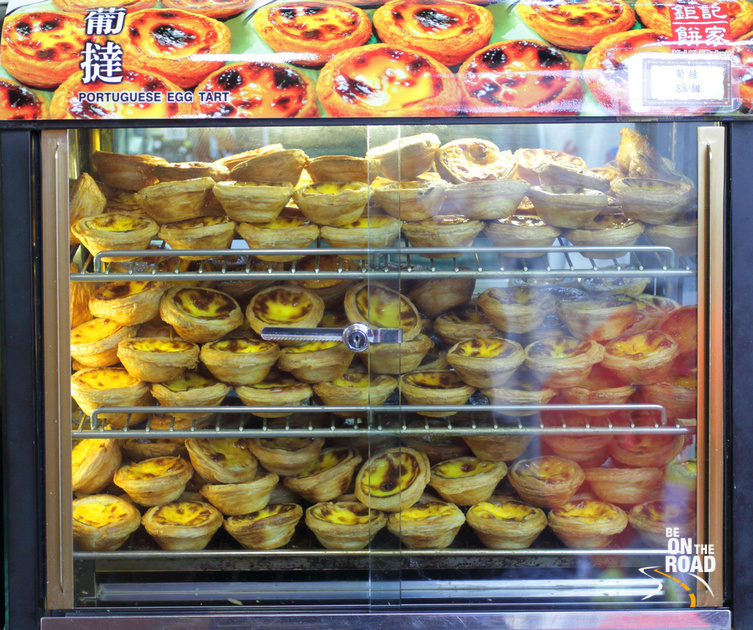 Moreover, no matter where you go, or which street you enter in Hong Kong, you are surprised by the vast variety of delicious street side snacks and tasty tidbits in so many different flavours. 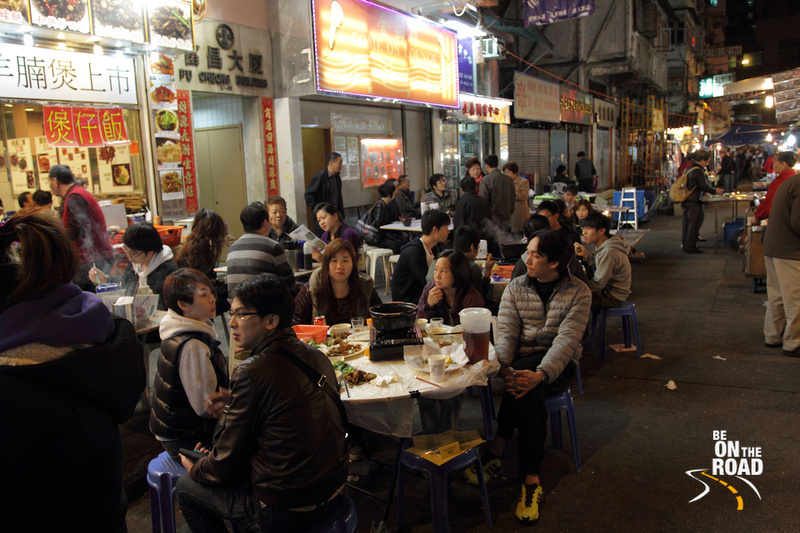 Needless to say, your trip to Hong Kong remains incomplete without tasting those delicious eats on the streets. Sure Hong Kong boasts of some of the finest dining experience you can enjoy at its elegant restaurants. However, nothing can beat the experience of enjoying the hot and fresh food sold right on the streets. As there are so many food choices in this culinary mecca, it is a good idea to go for one of those food tours in Hong Kong. It is an excellent way to know about the leading eateries in those humble streets and enjoy a treasuring dining experience. 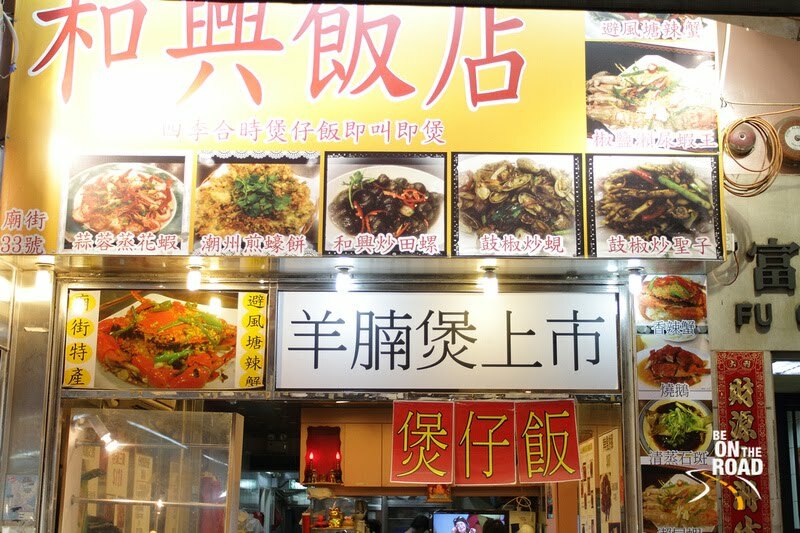 Here are street foods of Hong Kong that you must try before leaving the state. One of the most famous street food, you will love these very flavoursome fish balls that are served on almost every street in Hong Kong. Deep-fried in hot oil, the fish balls are then placed in a spicy curry. You will love those waffles with crispy, flaky edges and a soft and eggy centre. You will come across almost every local enjoying the street food with fruits, chocolate sauce or ice cream. The Egg waffles are served in various flavour and can easily fill you up. You will always find a long line for this favourite street food which is smooth rice noodle rolls served with sweet sauce. The smooth and savoury rolls topped with sesame seeds offer a more enjoyable experience and are a crowd favourite. Another of the most appealing street food is the fried pig intestines. However, this street food is only for the adventurous, but once you taste this snack, you will develop a craving for it. You can recognize this ubiquitous street food because of its bright yellow wrapper. You will love this steamed snack filed with fish meat and served with soy sauce. If you are looking for a perfect snack on Hong Kong streets, you will find it in those grilled squid tentacles. You will love the chewy and rubbery texture of these absolutely delicious squids. Pineapple buns are a delight, and they have a bit of pineapple in them as well as some butter in their sweet centre. These buns have remained a popular street food for decades and are enjoyed with traditional teas and coffee. When you bite into the fluffy and light egg custard, you will feel as if you are in heaven. You are sure to fall for these egg tarts with the crispy and chewy crust on the outside and the glistening yellow custard filling inside. Cheung fun is simply loved for its distinct chewy taste and smooth texture. 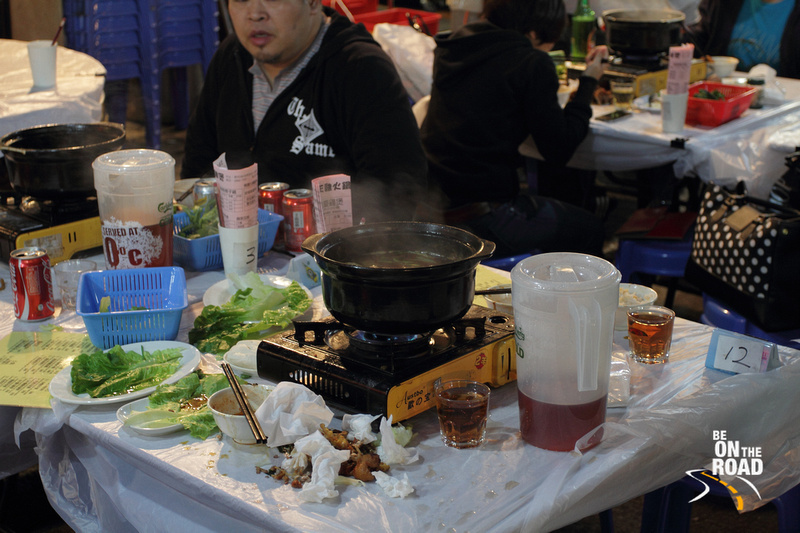 The street food comes without fillings and is made of rolling steamed rice noodle sheets. You can enjoy it with different sauces of peanut, chilli, and soy. Stinky tofu is another classic food that you must try. You may get a bit put off by the rancid smell, but once you taste it, you will simply love the street food that is perfectly crunchy. You can enjoy it with sweet, chili sauce and piping hot noodles. Enjoy a healthy snack of fried chestnuts which is simple but great-tasting. The best part is that they are served at all times on the streets of Hong Kong. It is hard to resist the enticing aroma of these nuts sold with a lot of hawkers in the city. The bowl pudding is available in white or brown versions. Everyone loves this ordinary bowl pudding which is like a sticky, glutinous mess with a slight sugary sweetness. Both versions are studded with red beans and remain a favourite with the locals. Rosogolla! Rasagola! Rasgulla! Whatever it’s spelling or pronunciation might be, this syrupy milk based dessert can certainly make your mouth water and every bite of it can take you straight to instant heaven. But, do you know where this dessert first originated? I had always thought that it had its roots in West Bengal, but apparently it has its roots in Odisha in Puri Jagannath temple and then a small village called Pahala that is located somewhere between Cuttack and the capital city of Bhubaneshwar. West Bengal is fighting this claim, but that is not the point here as both of them look and taste very different. While the West Bengal ones are smaller and white in colour, the Rasgullas from Odisha are light brown in colour and slightly bigger in size. Even the texture and juice is a bit different. So, in principle, we can consider both of them as separate desserts/sweets. We all now the importance of Puri Jagannath temple on the pilgrimage route. It is one of the 4 dhams and its significance is food. The 56 blog or chappan bhog has legendary status in Puri’s Jagannath temple and people from all over come to get a piece of it. While the chappan bhog is offered to Lord Jagannath, Balram and Subadhra, the Rasgulla has been traditionally offered as bhog to goddess Lakshmi at the Jagannath temple. There is documented evidence of this tradition since the 12th century, but like the Puri Jagannath temple, no one knows the exact age of this Rasgulla tradition. Now, there are two essential stories that one has to know to understand this ancient tradition. First, there is a legend surrounding the Jagannath temple. Apparently, Lord Jagannath goes on a 9 day Rath Yatra without telling goddess Lakshmi and this makes her extremely angry. She locks one of the temple gates and prevents Lord Jagannath and his convoy from entering the garbha griha. To appease Lakshmi’s anger, Lord Jagannath offers her Rasgullas. This ritual, known as Bachinaka, is part of Niladri Bije observance, which marks the return of the gods to the temple after the Rath Yatra. The second story is folklore. There is a village called Pahala located on the outskirts of Bhubaneshwar that was home to a lot of cows and that produced a lot of milk. The villagers did not know what to do with the extra milk and used to throw it when it got spoilt. One day, a priest from the Puri Jagannath temple saw this milk wastage with shock and to ensure that such practice of waste did not continue, he taught the villagers the art of curdling the milk and gave them the recipe of the Puri Jagannath temple Rasgulla. The villagers of Pahala took this new learning with gusto and ended up becoming one of the leading market for Chhena based sweets in the state. 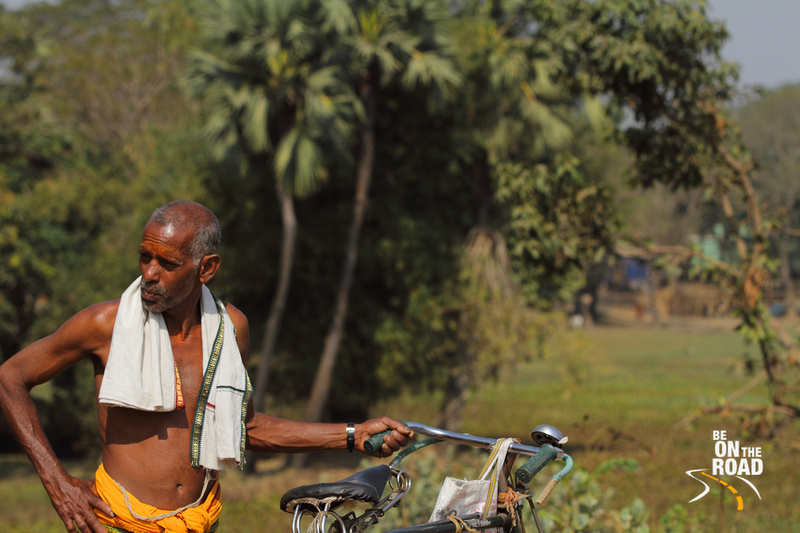 Some even say this village sends their produce to Puri Jagannath temple every day. No one knows the exact history of this practice, but it looks like it has been going on for many hundreds of years. 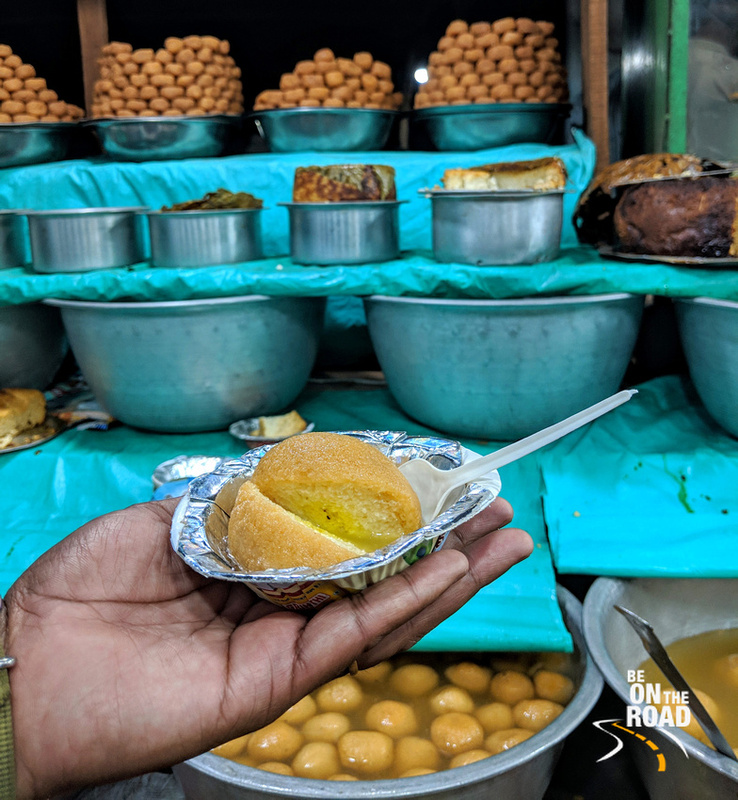 Today, Pahala is one of the famous locations for the Rasgulla, Chhena Poda and Chhena Gaja, all of them being chhena based sweets. It is also one of the largest manufacturing hubs of the Rasgulla in the state of Odisha. 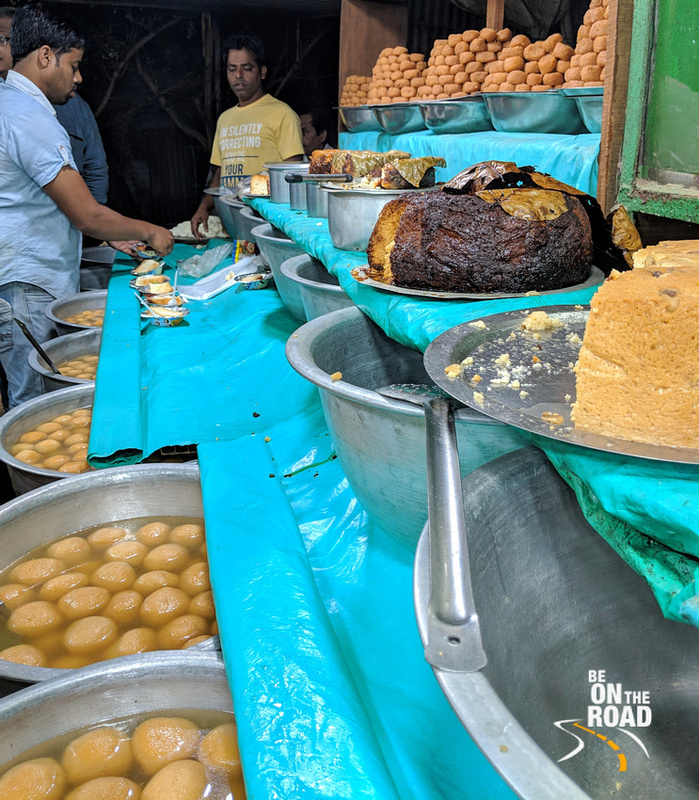 There could be many locations elsewhere in Odisha where you can get better quality and taste, but if you want to experience tradition, you have to visit Pahala and try out a Rasgulla and Chhenna poda, which is considered to be the iconic dessert of Odisha. And in case you are wondering about the Rosogola of West Bengal, it is indeed different from the one made and consumed in Odisha, but it was brought to West Bengal and Bengali families in Odisha through Odia cooks and it then went on to re-innovate itself under the able guidance of Nobin Chandra Das, a Kolkata based confectioner. Now, that the history bit is all clear, lets get to matter at hand and relish these amazing desserts. An absolute must experience on your next holiday to Odisha or a trip to Bhubaneshwar, Cuttack or Puri. We all know about the rich heritage of India that dates back many thousands of years. While there are many popular heritage destinations strewn all across the country, there are some lesser known ones too. I like to point your attention to the state of Odisha that has many such unexplored heritage gems. 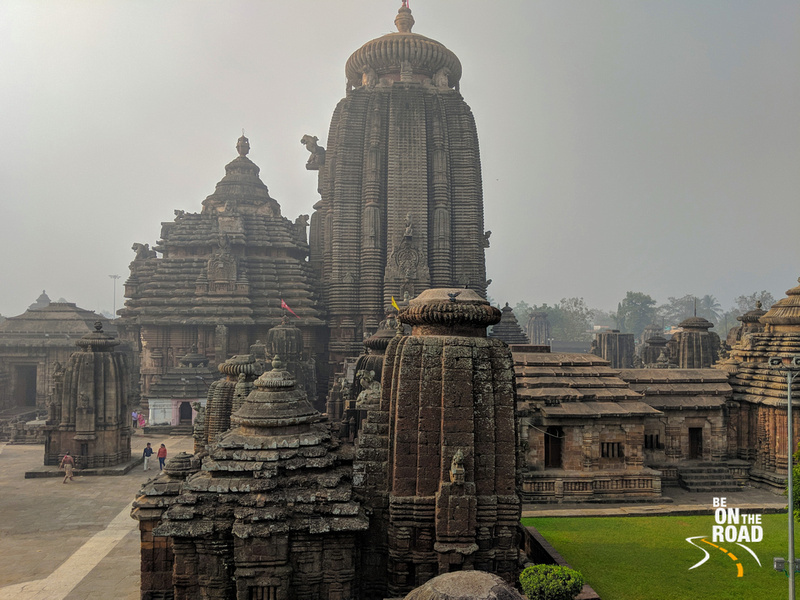 From some of India’s oldest cave temples to shadow puppetry, from ancient Buddhist sites to 2500 year old art forms, from some of the most intricate temple architecture to some of the oldest maritime trade centers and from beautiful sand art to some of the most graceful dances, Odisha seems to have it all. 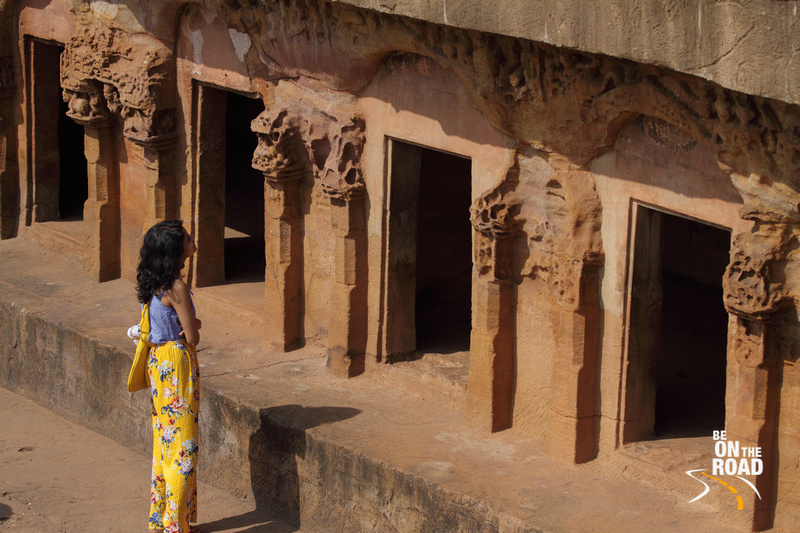 This photo story aims at bring these unexplored heritage gems to light. Thank you Odisha Tourism and Times Passion Trails for letting me experience them up close and in real. Do plan a holiday to Odisha, India’s best kept secret, if this article piques your interest! 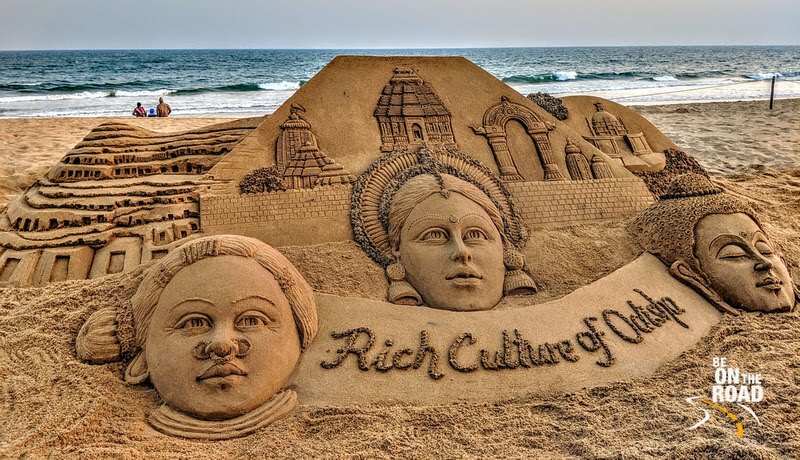 Above photo: Odisha is the home of world renowned sand artist and Padma Shri awardee Sudarsan Pattnaik who has represented India in over 60 international sand sculpture championships. 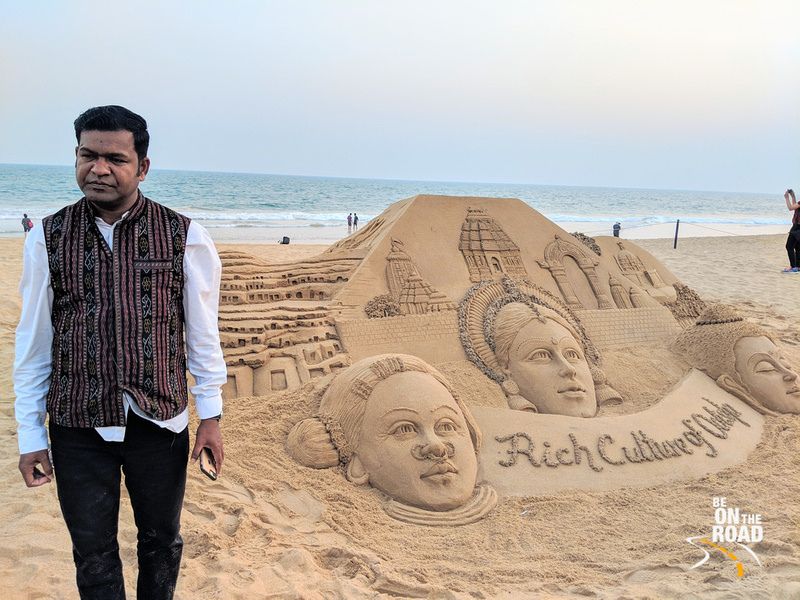 Hailing from poor family and with the blessings of Lord Jagannath, it was at Puri beach that Mr. Sudarsan Pattnaik honed his art. If you happen to be in Puri, do visit his Sudarsan Sand Art Institute. Above photo: Said to have originated sometime in 5th century B.C in India, Greece or China, Shadow puppetry still exists in Odisha. Called Ravana Chhaya, these shadow plays of Odisha, portray the abduction of Sita, the Quest for Sita, Mahalaxmi Katha and many other mythological and contemporary stories. 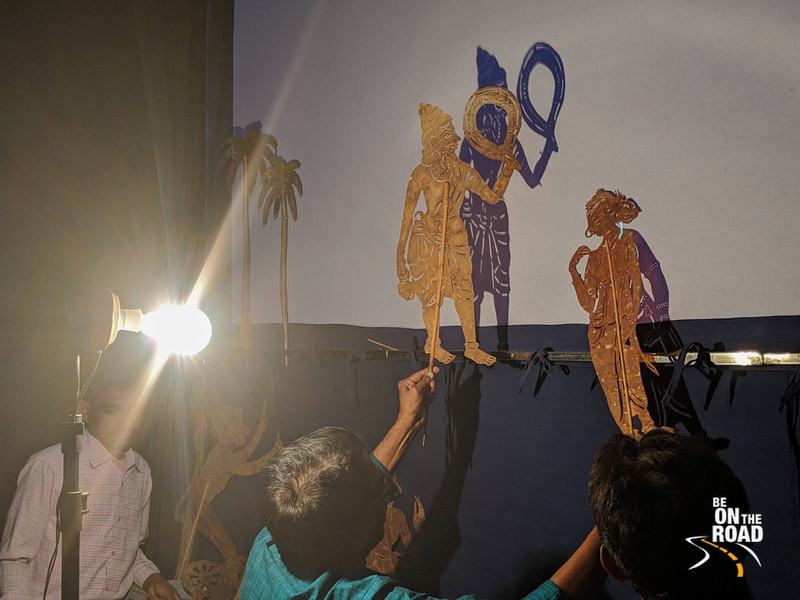 It is from Eastern and Southern India that such shadow puppetry find its way to South East Asia and East Asia, possibly during the reign of King Ashoka and the Chola Kings, both of whom were extremely strong sea farers. Above photo: Considered to be the gem of Kalinga architecture, the Mukteshwar temple dates back to 950 AD. 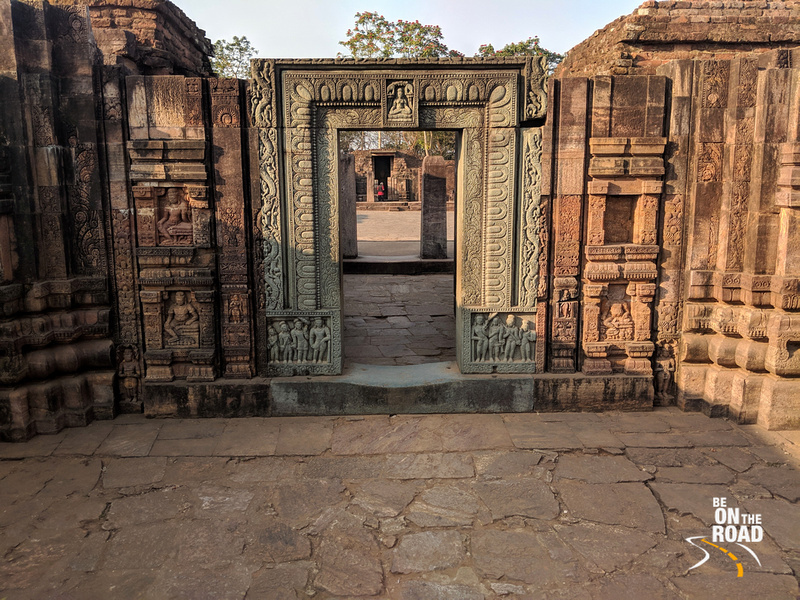 Preceding both the Lingaraj and the Rajarani temples of Bhubaneshwar, the Muktesvara temple is the only temple in this region that has a torana or porch. It is full of lattice work and intricate carving and sculpting. It is believed that many artisans of the later years took inspiration from this temple for their designs. Above photo: Somewhere in the 5th to 6th century AD, there were Buddhist monasteries and universities in Odisha where Buddhist monks focussed on their monastic life and meditation studies. Ratnagiri, along with Lalitgiri and Udaygiri is part of the Pushpagiri Buddhist maha vihara is believed to have the birth place of all the preachers of Buddhism. It is from these Buddhist universities that Buddhism is believed to have traveled to China, South East Asia and the far east. 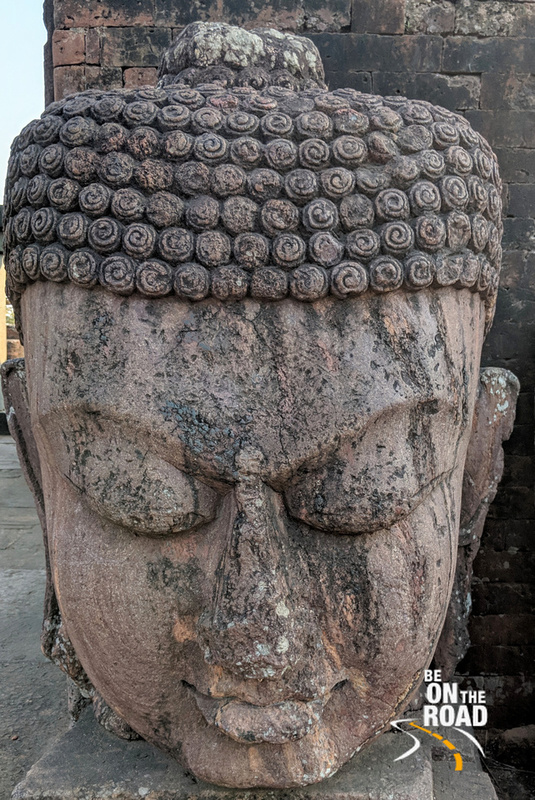 Such massive Buddha statues and many votive stupas can be seen all across Ratnagiri ruins. Above photo: The UNESCO World Heritage Konark Sun Temple is something that most of us are aware of. It you are not, just look at the back of the new 10 rupee currency note and you will see it. This magnificent Sun temple is a stunning work of art, creativity, size and technological brilliance. 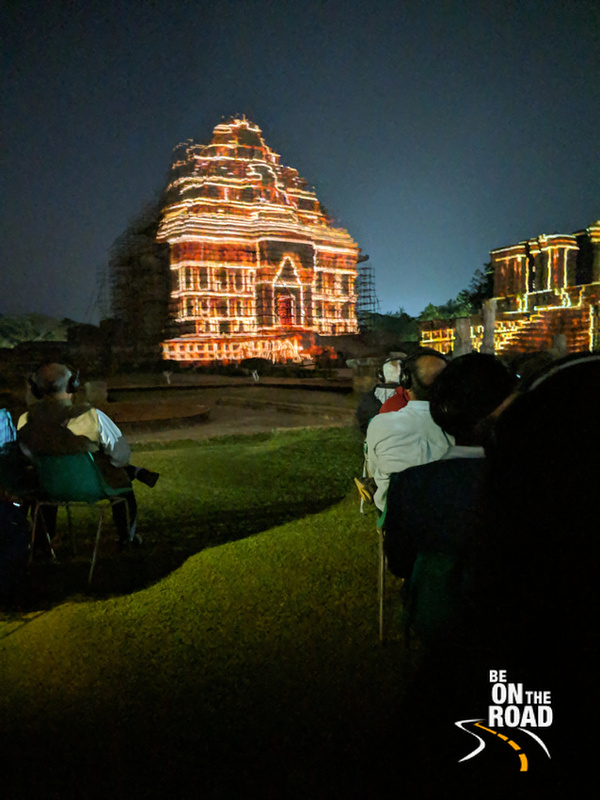 The evening sound and light show at this temple is a great way to rewind the years and understand the why, how and when of this temple. While some of the story is factual, the other bit is folk lore and mythological. Nonetheless, a captivating 35 minutes in front of one of India’s best temples. 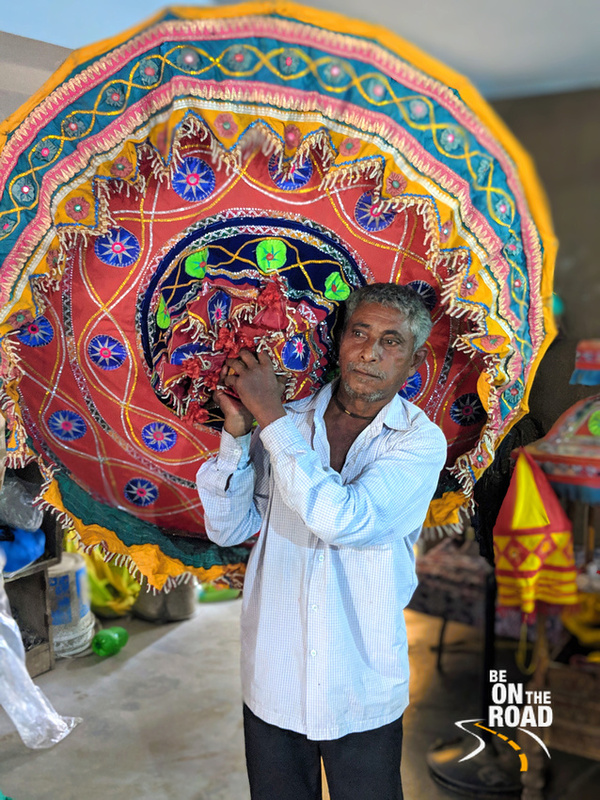 Above photo: Have you seen the colorful umbrellas that protect the Lord Jagannath, Balram and Subadhra from the elements during the Rath Yatra? That umbrella is the work of artisans from a small village called Pipili and their craft is called Chandua or Indian applique work. What started as a craft to decorate the gods has now evolved into wedding shamianas, bags, wall hangings, lamp shades, umbrellas and so much more. 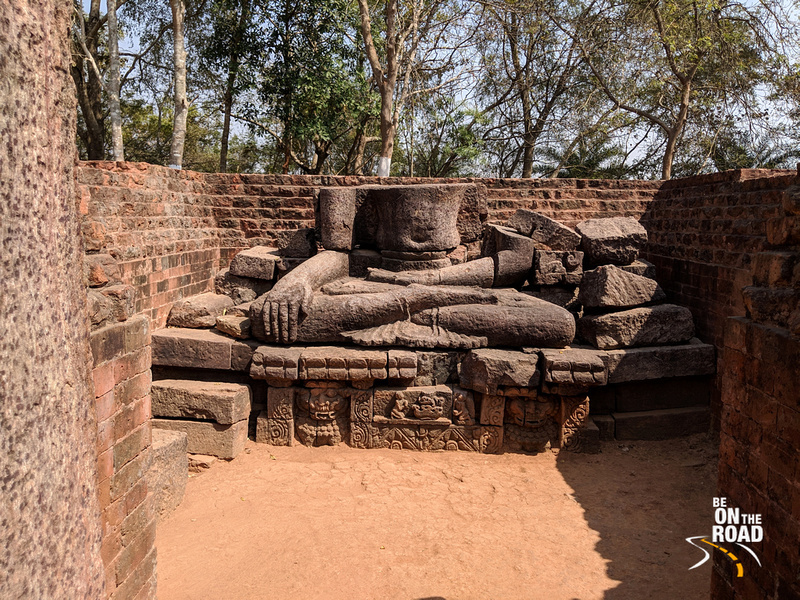 Above photo: One of the earliest sites of Buddhism in Odisha, it is believed that Buddhism was practiced, preached and taught unbroken from the 3th century BC until the 10th century AD. 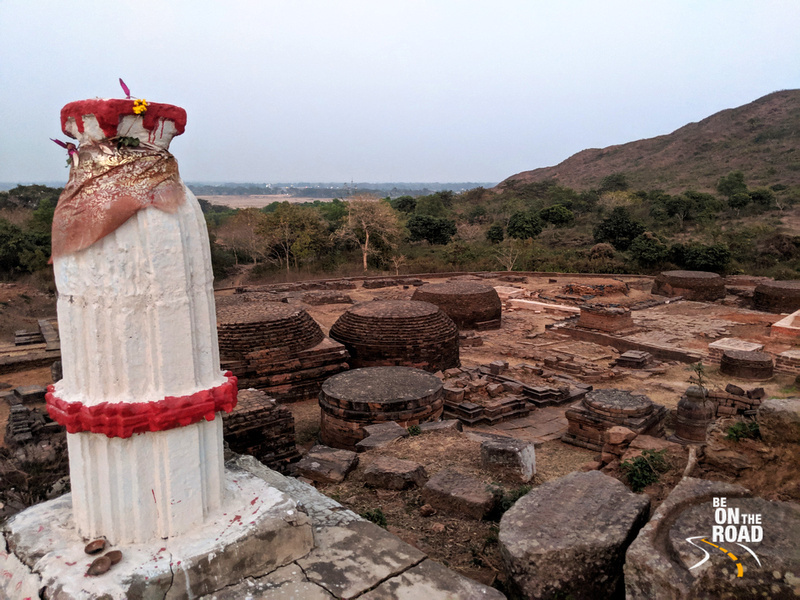 While a big stupa still stands intact even today, many brick and stone based remnants adorn the rest of the landscape. Stupas, sculptures of Buddha, Avalotikeshvara and Tara can also be found here. 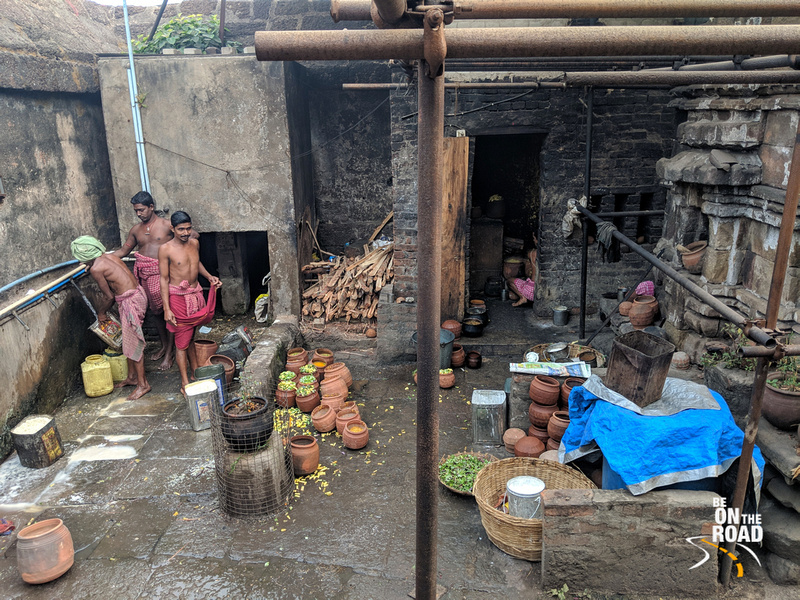 Above photo: For over 700 years, the Anant Basudev temple in Bhubaneshwar has cooked food in their temple kitchen and offered it to the temple gods. There were wars, famines, fires and many other calamities during these 700 years, but the temple never once shut down its kitchen. This temple built in the 13th century overlooks the Bindu Sagar lake and is just a stone’s throw away from the famous Lingaraj temple. 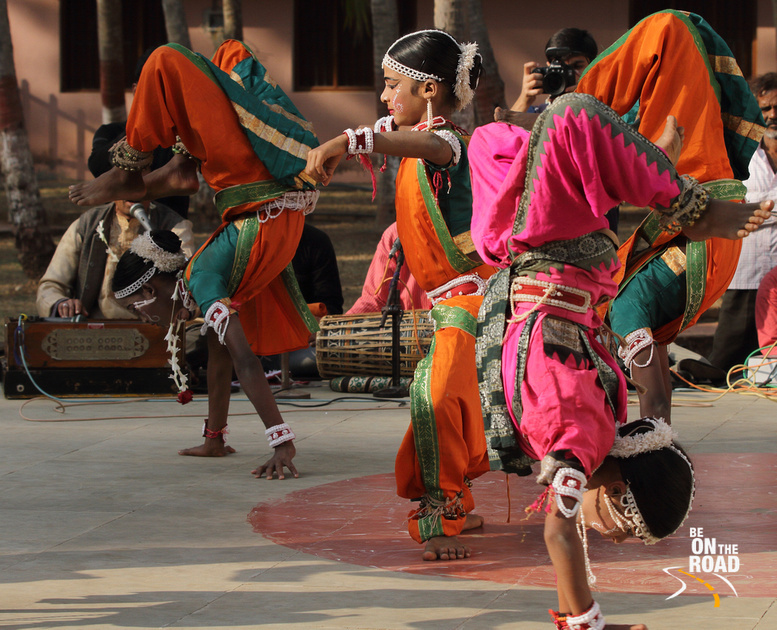 Above photo: Present day Odissi classical dance forms have been influenced by this dance form that originates in the village of Raghurajpur and where boys dress as girls and show a combination of grace, strength and acrobatics through their dance. 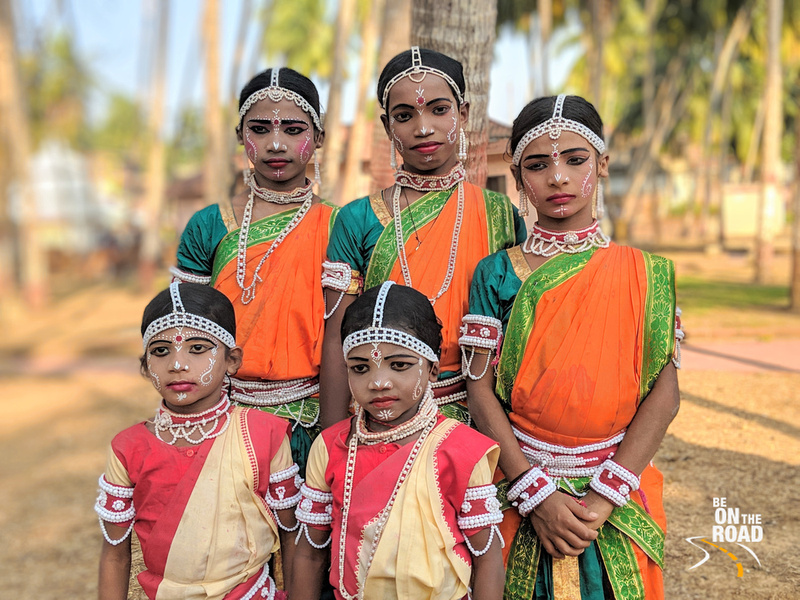 Gotipua, which means ‘single boy’ in Odia language, is a traditional dance form of Odisha where young boys dress as women to praise Lord Jagannath and Lord Krishna. 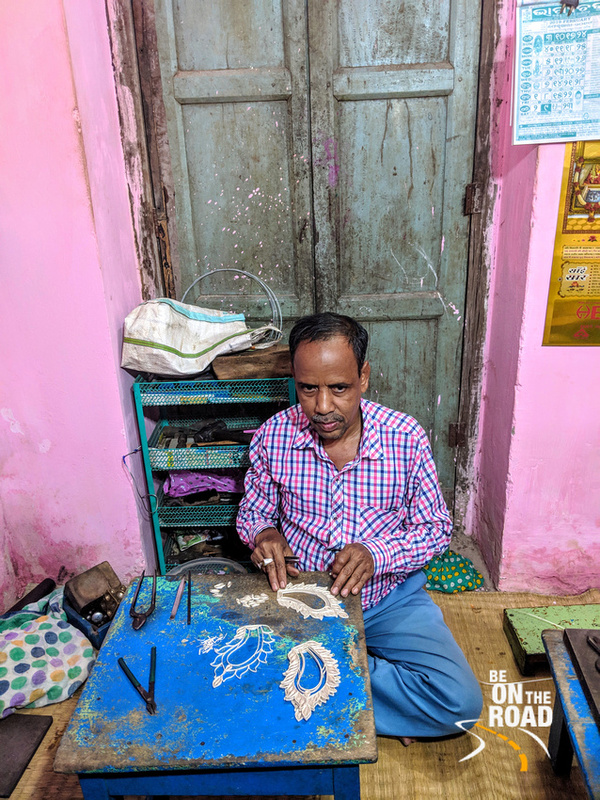 Above photo: More than 500 years old, Tarakasi is a type of silver filigree work that flourishes in the old parts of Cuttack even today. Rich in patterns, Tarakasi jewellery specializes in necklaces, toe rings, anklets and arm jewellery. Based on mythological themes and traditional designs, they are heavily sought after by temples and pandals to decorate their gods, by Odissi dancers and during marriage functions. Above photo: Odisha is land of many indigenous communities or tribes and each tribe adds a bit of rich heritage to this state. 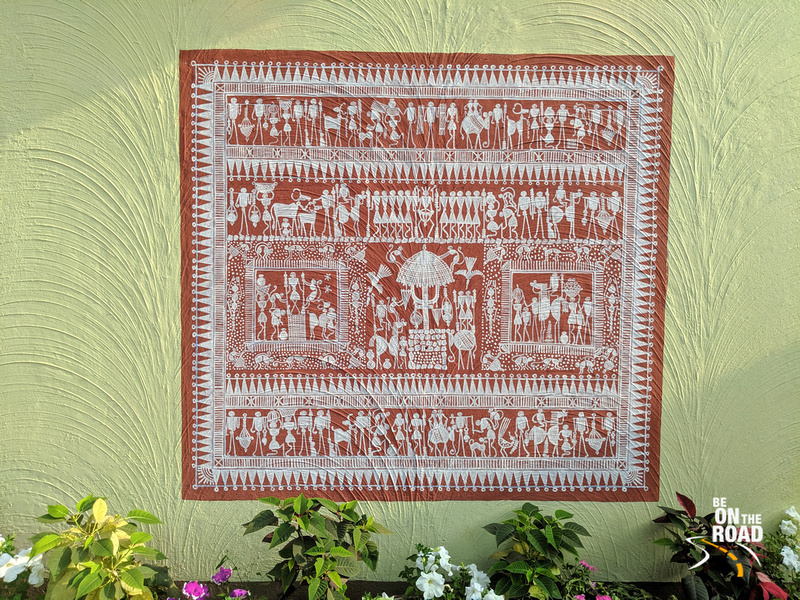 Like the famous Madhubani art from Bihar and the Warli art of Maharashtra, the Saura (Saora) tribe of Odisha, considered to be among the most ancient tribes of India, have their own unique art form that is referred to as Saura art. Saura art uses clear geometric frames and shapes, natural dyes and raw materials that they can find in the earth around them. Originally used to paint the walls of their homes, they were use extensively in festivals and cultural occasions. Today, they can be found in everything from T shirts to wall hangings, mugs, lamp shades and more. 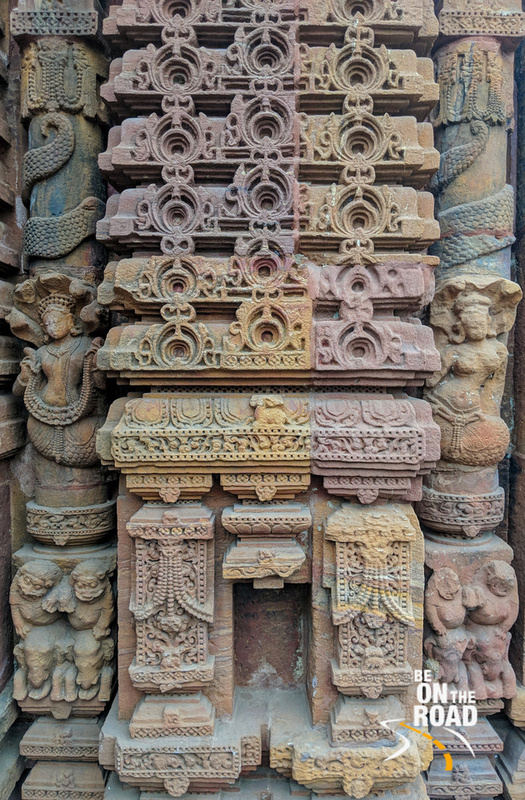 Above photo: When you go on your Bhubaneshwar heritage walk, you will walk through a maze of temples. Apparently, these temples were like prototypes before the final work product. You will notice many small temples next to the finished and more prominent one. 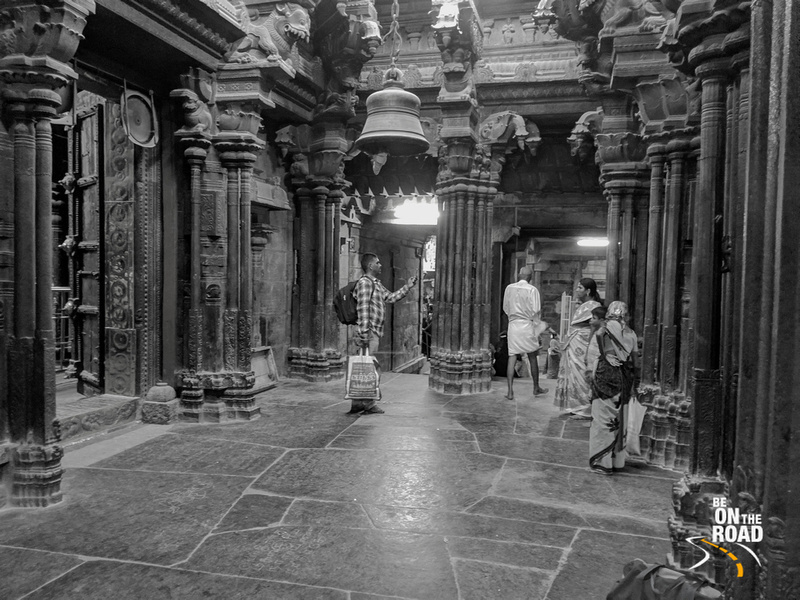 You will see this trend at Muktesvara, Raja Rani, Linggaraj and Parasurameswar temples. Such practice ensures that the final temple is a work of true class. 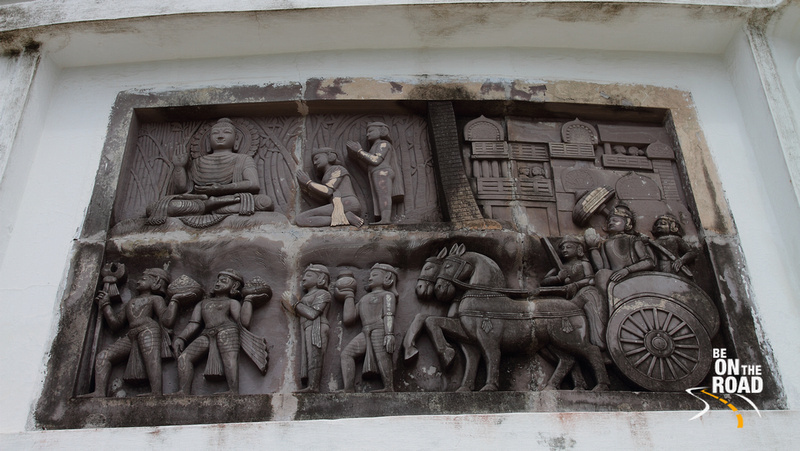 See for yourself in this beautifully sculpted wall of the 7th century Parasurameswar temple. Above photo: Many of you would not know, but Kalinga was considered a gateway to the east in the 3rd to 1st century BC, thanks to the maritime ambitions of King Ashoka and the Maurya and Kalinga empires. The kings used it for maritime trade then. Buddhism spread far and wide thanks to this maritime trade. Then, the British got on to that maritime bandwagon. And we continue to utilize it even today. Paradip and Gopalpur on sea are some of the main port locations. 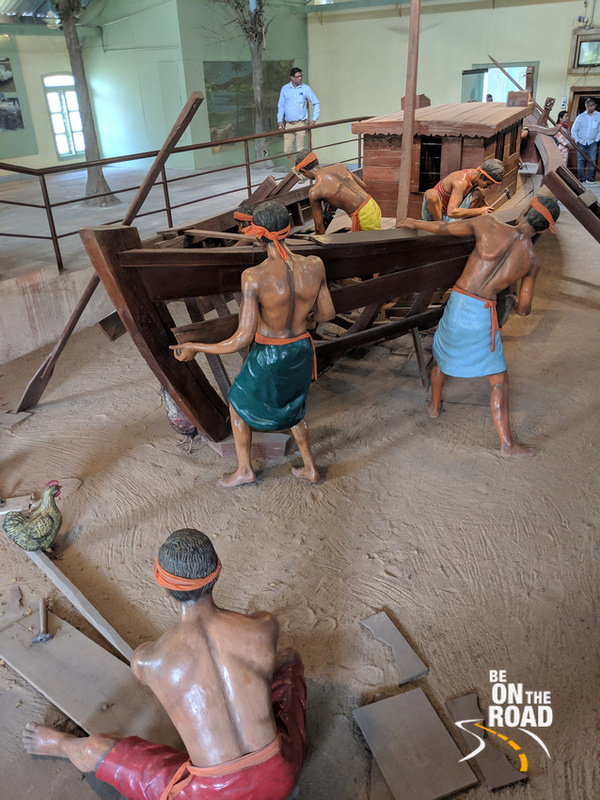 In Cuttack’s Odisha State Maritime Museum that was opened in 1869, you can see all of this rich maritime history right from the days of King Ashoka and how it has been documented in all the religious scripts and documentation of that era. Above photo: For a very long time, I thought West Bengal was the home of the Rasgulla, till I visited Pahala and learnt of its rich history with chenna based products, especially Chenna Gaja, Chenna Poda and Rasgulla. 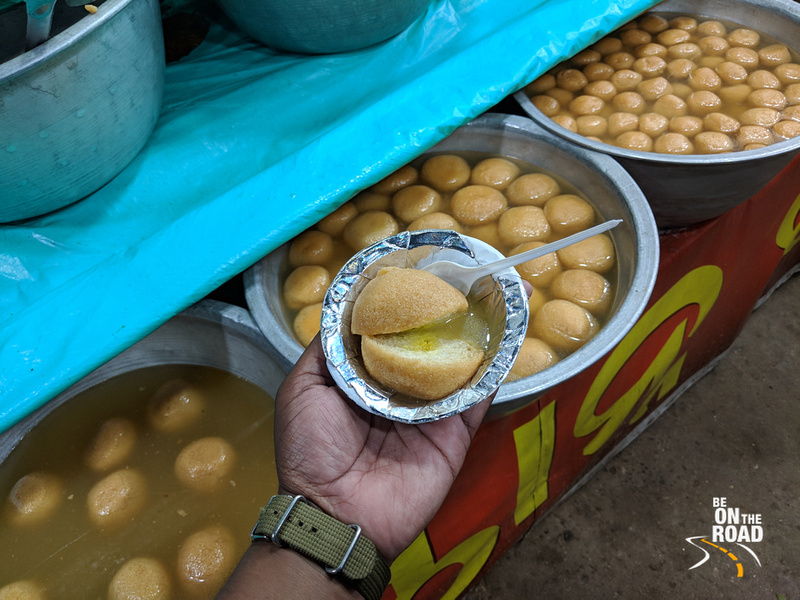 Even though, this is in dispute, there is a lot of folklore and history that says that Odisha’s first Rasgulla was made at Pahala. West Bengal’s Rasgulla is different from the one made in Odisha and is considered to be a variation of the Odisha Rasgulla. 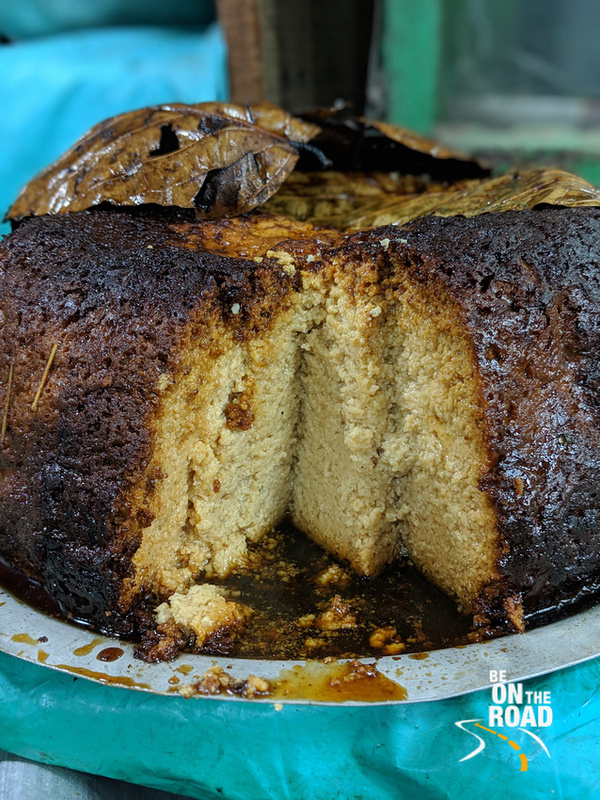 You have to try out these milk based desserts for an authentic Odisha holiday experience. Above photo: Most of our ancient scripts in India have been written on palm leaves. After all, this leaf and the inscriptions on it are believed to exist for many centuries. The artisans of Raghurajpur too use palm leaves, a blunt metal pencil and soot to make beautiful paintings. These paintings are called Tala Patra or Tadopatra and are believed to withstand the true test of time. Mythological stories from Hinduism and Buddhism are usually portrayed here. 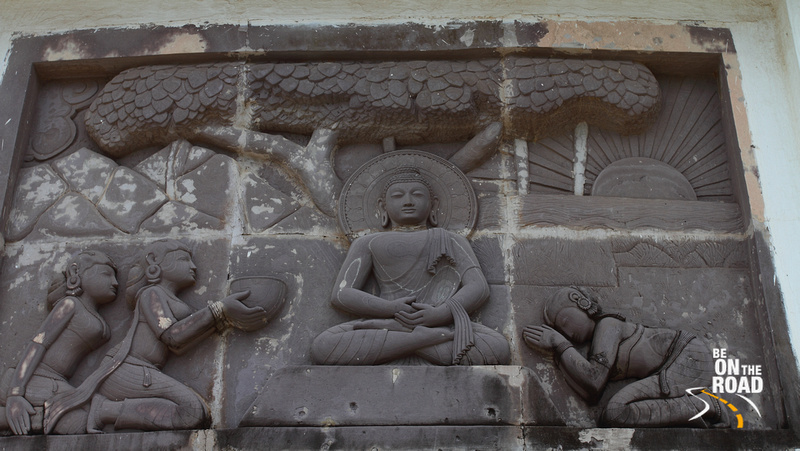 Above photo: Along with Lalitgiri and Ratnagiri, Udaygiri forms the Pushpagiri Buddhist university. 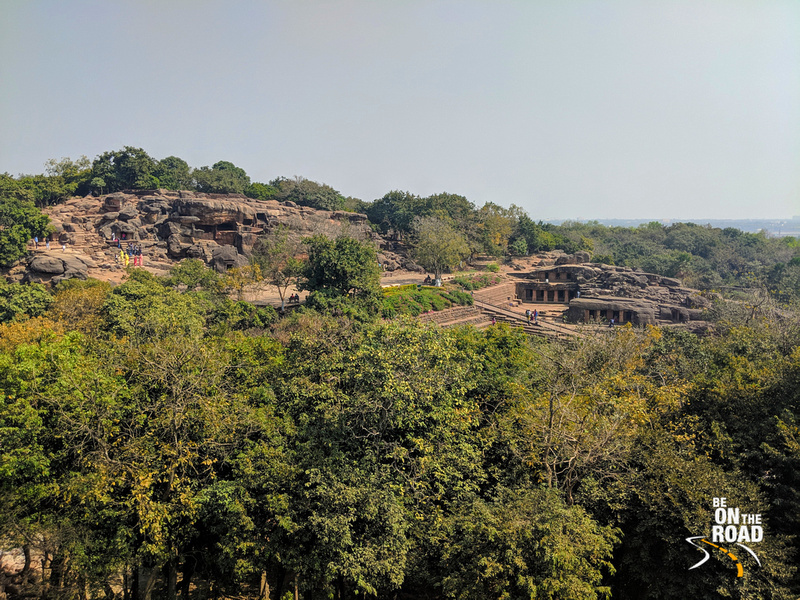 In this picture, you can see the ruins of Udayagiri with living quarters for the monks, meditation rooms, large school premises, a well laid out drainage system and a stepwell to draw water. Some of these ancient brick structures have withstood the test of time and are a treat for all heritage lovers. Above photo: Udayagiri caves near Bhubaneshwar are home to some of the oldest living cave temples of India. Dating back to 2nd century BC, both Udayagiri and Khandagiri that is right opposite it, is made up of finely ornate and well sculpted figures. They were initially built as residence for Jain ascetics during the reign of King Kharavela. 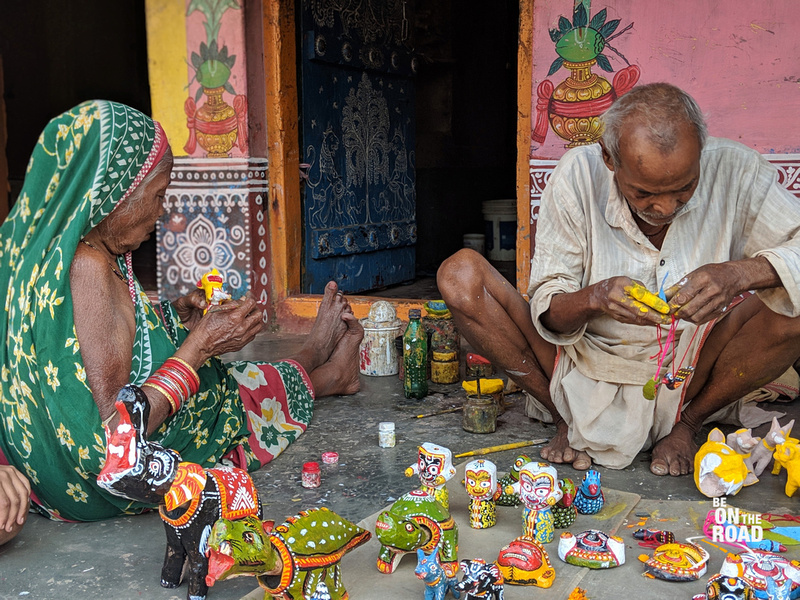 Above photo: Along with Patta chita, Tala Patra and Goti Pua, Raghurajpur is home to yet another handicraft. 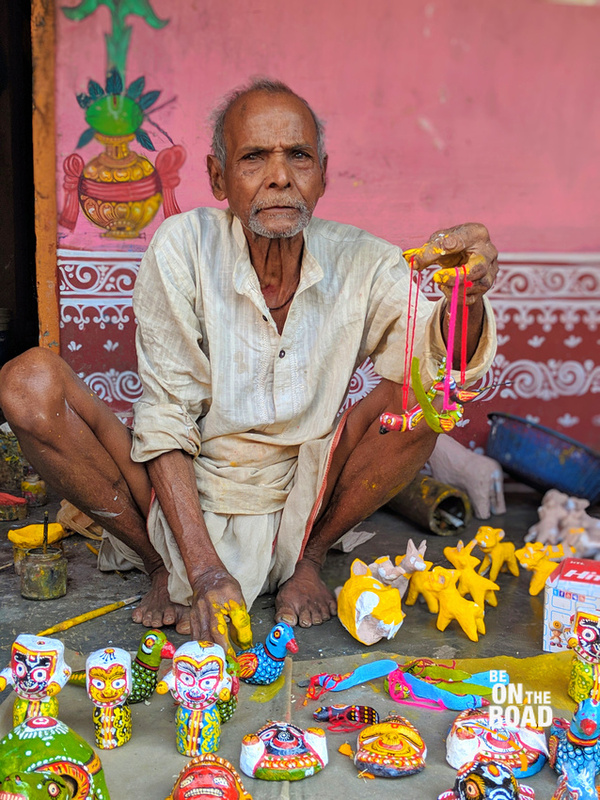 There are a group of artisans who make toys and small figures with papier mache, waste products and cow dung. Faces of gods are the usual theme, but sometimes regular birds and animals are also made using these raw materials. Once the product is done and ready, it is then colored using natural dyes. Above photo: You cannot come to Odisha and not watch a traditional Odissi classical dance performance. The grace with which they enact Krishna Leela and Ram Leela is a treat for the eyes. In case you didn’t know already, this is an ancient dance form and is believed to have originated in the Hindu temples of Odisha. If you watch closely, you will notice that many sculptures of dancers in these temples are in this dance position. 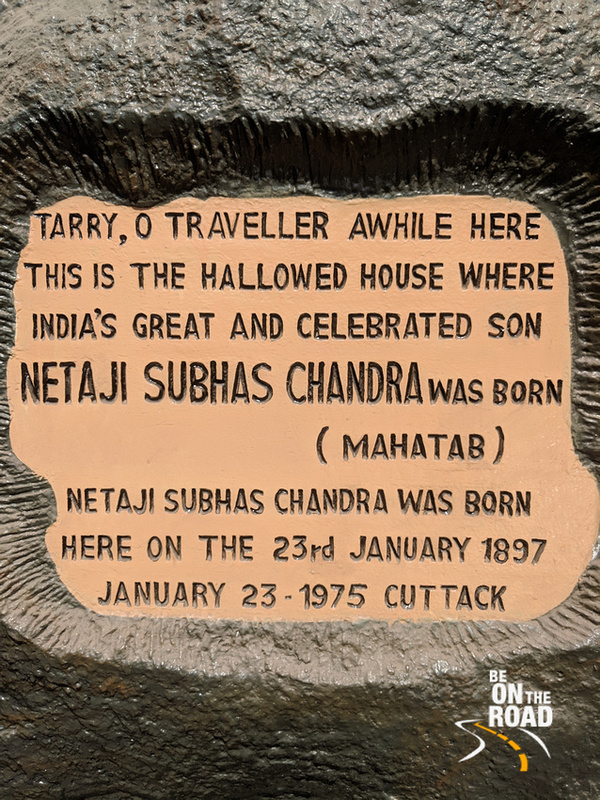 Above photo: Did you know that Netaji Subash Chandra Bose was born in Cuttack? We all know his Bengali roots, his fight for freedom, his revolutionary thoughts and his skills in money, law, articulation, flying and strategy. All of this started in Cuttack where he was born. Today, his birth home is preserved as a museum and shows various facets of his life. Above photo: One of Odisha’s best handicrafts, you can say that I have kept the best for the last. 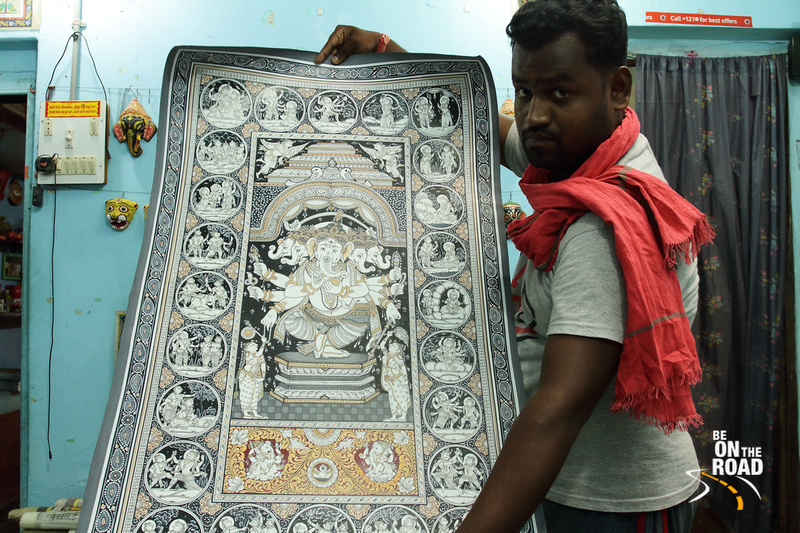 Pattachitra is that 2500 year old art form that once began for the gods and then evolved in so much more. 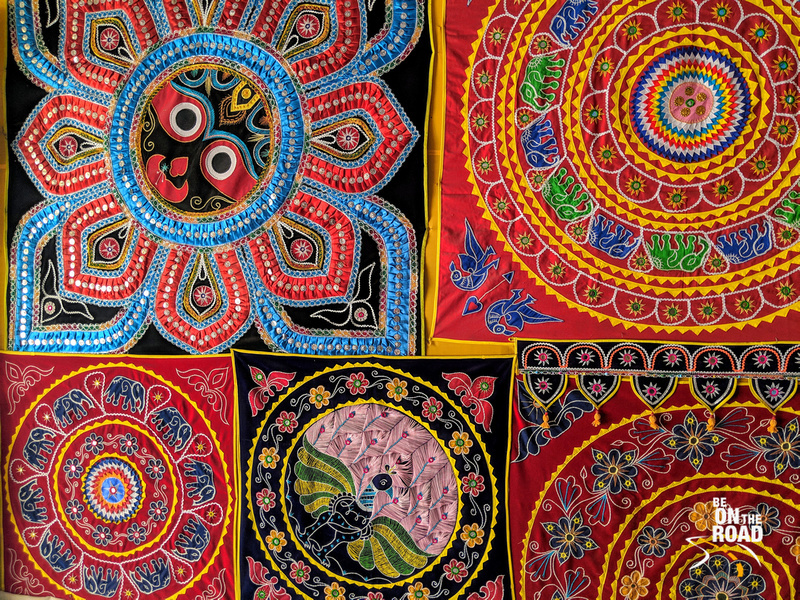 Stories of Ganesha, Shiva, Krishna, Rama, Durga, Buddha and so many others have been made on this hand made cloth using colors and products that are found naturally in the land of Odisha. These paintings can last for hundreds of years without losing even a bit of their brilliance. 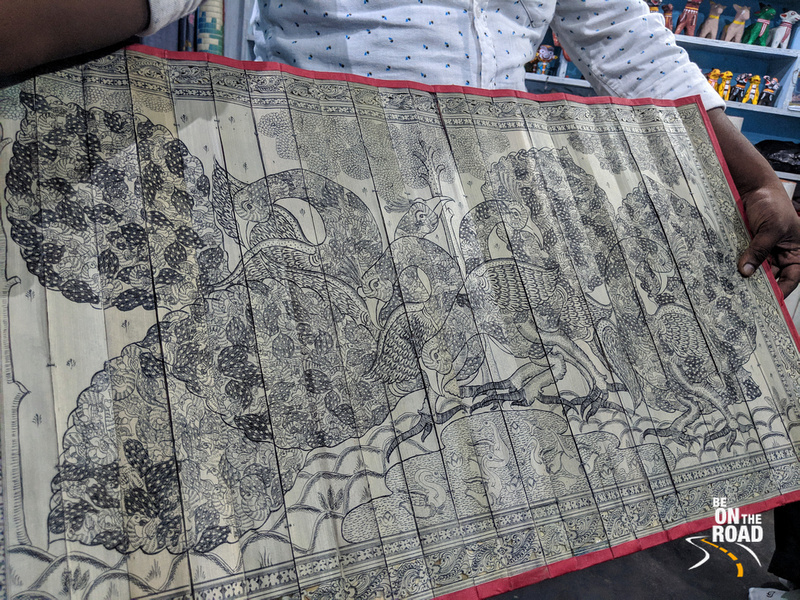 Today, the Pattachitra enjoys iconic status and they are even replicated on silk sarees for custom orders and marriages.